Spray 6-quart oval slow cooker with cooking spray. Make cuts about 1 inch apart and 1/4 inch deep in diamond pattern in top of ham. Place ham cut side down in center of slow cooker. Arrange potatoes and onion evenly around ham. Pour broth on top of potatoes and onion. In small bowl, mix remaining ingredients. Pour mixture on top of ham, potatoes and onion. Cover; cook on Low heat setting 4 to 5 hours or until potatoes are tender and instant-read thermometer inserted in center of ham reads at least 145°F. Remove ham to cutting board; cover loosely with foil, and let stand 15 minutes. To serve, cut ham into slices, and transfer to serving dish. With slotted spoon, transfer potatoes and onions to serving dish with ham. Spoon some of the cooking juices on top of ham, if desired. 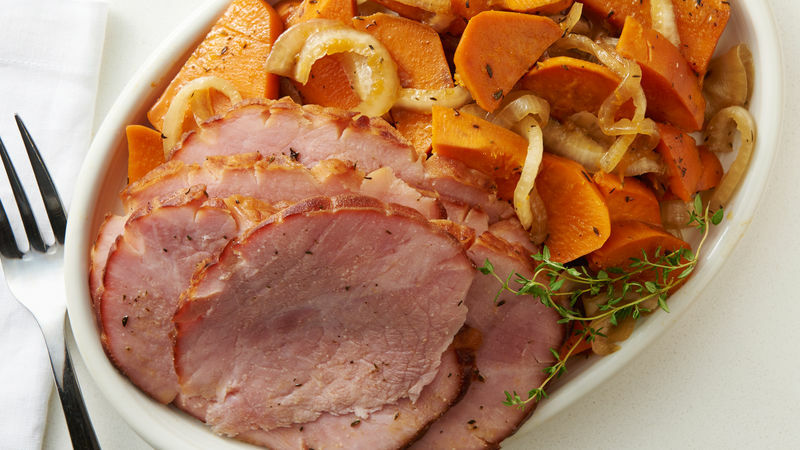 An oval slow cooker provides more room for potatoes and onions to cook evenly along with the ham. Garnish with a sprinkle of chopped fresh chives or Italian (flat-leaf) parsley, if desired.